From Weapons to Want: redirecting excessive military spending to global social need. A proposal to develop a structural campaign through the lens of the winners & losers in the global military spending relationship – governments and defence industries; citizens and our environment. 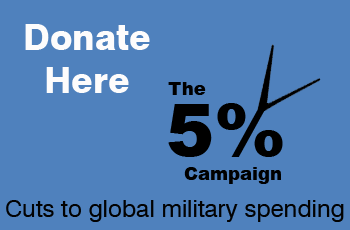 THE FIVE PERCENT CAMPAIGN TARGETS global excessive military spending – and the public perception of it – in order to redirect our taxes to fund what the world wants and needs. Our proposal argues that there is a great deal to be gained from an increased effort to place excessive global military spending alongside other established ‘structural’ campaigns in order to divert taxpayers money to better use, whether that be international ‘development’ focused or in support of the global green economy, and, as a result of a more intense spotlight on it, become more widely integrated into civil society dialogue and activism. By joining the ranks of debt cancellation, financial transaction and other tax related measures, military spending savings could be regarded as yet one more significant ‘new’ revenue stream, redirecting the funds captured to serving the needs of the global community. Inevitably, increased debate around what we mean by ‘defence’ and, central to this, the question of whose interests are really served by the ever increasing global military expenditure would be at the heart of this effort. And that, ultimately, brings us back to the fundamental need to see military spending as every bit as central to understanding power, poverty, economic collapse, unjust distribution of resources as other structural campaigns like debt, trade, tax, climate change and most recently the ‘war on drugs’. It is not an adjunct to any of these issues – it is implicated in each and every one of them. To offer up a new, feasible formula for delivering deep, sustainable cuts to global military spending that targets every government on the planet with a fair, proportionate and achievable calculation to reduce their military spend and to redirect savings to address the economic and environmental catastrophe which the 99% are facing. To engage and mobilise the wider NGO community in the UK (and by extension, their supporter base) around the issue of runaway global military spending. In particular, to recognise the importance of the development sector and to galvanise it to join with a growing number of organisations here and around the world, who seek to place excessive military spending centre stage. To build on the extensive and longstanding policy and campaigning work undertaken by organisations in the peace movement sector, across many inter-connected issues; and for this work to be the foundation stone for building a wide-base, paradigm-shifting international coalition of common interest that folds development, climate and other relevant policy areas into its activity. To endeavour to grow a global coalition around The 5% Formula with strong, regionally relevant campaigns (ie Europe, USA, Middle East, sub-Saharan Africa, Far East) – yet with the common understanding of how military spending and the arms industry by extension, is a globalised industry, enforcing the globalised nature of power and economic interests. To persist and insist that excessive military spending be regarded as a ‘structural’ issue – as central to understanding power, poverty, economic collapse, unjust distribution of resources as debt, trade, tax and climate change. It is not an adjunct to any of these issues – it is implicated in each and every one of them. To change the way the public thinks – and by default – influence the media debate regarding military spending and ‘value for money’: jobs, security, and geopolitical status. The 5% Formula is a mechanism to achieve major, year-on-year cuts to global military spending over 10 years and beyond. It is a long-term, sustainable campaign, with a top-line demand that works for civil society groups in every country where there is a perceived value in challenging policies concerning military spending. It would see annual global military spending cut by 40% after the first decade, back to mid 1990s spending levels ie $1 trillion dollars, the lowest in recent history (and even then, ‘low’ is not low enough for many peace campaigners – indeed far from it). This would deliver an estimated $700 billion to be redirected to core urgent human and environmental needs. After the first 10 years, we call upon all nations to adopt the 5% threshold rule to sustainably restrain the global military spending – no country allows any increase in military spending to outstrip economic growth. The 5% Formula would therefore drastically cut annual military spending to $1 trillion in a short but practical period of time and then maintain an effective check on military spending in perpetuity by considerably lagging its annual change behind economic growth. The 5% Formula would be applied for the first decade as follows: we call for all nations to cut their annual military spending by 5% every year. Our primary targets are the ‘Top 20’ military spending nations who account for 87% of total spending ($1.7 trillion dollars) in 2012. 5% annual and absolute cuts to national military budgets: This is equivalent to a compound 40% cut for each nation’s respective annual military spending after 10 years (see the Table on the right for illustration). These cuts are expected to deliver an estimated $700 billion in total to be redirected. The 5% threshold rule is designed to be mainstreamed into budgeting beyond the first 10 years, acting as both a military expenditure ‘dampener’ and a economic growth ‘accelerator’  for all nations, while facilitating and enabling the public to more deeply interrogate the many inter-linked issues of the military spending debate. In many ways, military expenditure hinders rather than advances economic prosperity, compared to investments by the government in other productive areas of the economy. The 5% threshold rule ensures a government allocates more of its revenue to grow the economy while still preserving its ability for sensible defence. All nations adhere to a ‘5% threshold rule’, where military spending growth (% change) in a given year is limited by previous year’s economic growth (measured as % increase in gross domestic product or GDP), less 5 percentage points (5%). The fast-growing economies (eg BRICS), according tothis rule, might be able to increase their spending in some years if their economic growth merits it (albeit at a much lower rate than they might otherwise do without the threshold). In that case, there will be no ‘cuts’ per se to their military spending to be diverted, we propose that they are therefore required to ‘gift’ a contribution of an amount equal to 2.5% of their previous year’s military spending to fund international development programmes. RUNAWAY MILITARY SPENDING ~ WHO BENEFITS? Two trillion dollars and rising – the recession notwithstanding. But to fight who or what? Selling the myth of insecurity to their publics while maintaining highly competitive and globalised arms industries ensures that the USA, UK, France and Germany remain in the top 10 of the world’s biggest spenders – a fact closely tied to their role as manufacturers and sellers. With the BRICS nations, plus Japan and Saudi Arabia, completing the top 10, we see how the entire planet is now caught up in increasing militarisation. But who is the enemy? The so-called perceived enemies of the West – i.e. North Korea, Iran, Sudan, Syria, Cuba and Libya – reportedly accounted for less than 1% of the global military spend in 2011. Even if we factor in China’s defence spending and Russia’s spending, the total defence spending of all these states (‘potentially hostile’ to the US and NATO) came to just about 13% of the global total. Furthermore, 60% of global arms sales are from rich countries, eg G8 nations, to developing countries, with USA and Russia alone responsible for two-thirds. The SDGs – Pushing Beyond a Reduction in Illicit Arms Flows. SDG 16 (of 17) is tasked to promote just, peaceful and inclusive societies. The Sustainable Development Goals (SDGs) aim to significantly reduce all forms of violence, and work with governments and communities to find lasting solutions to conflict and insecurity. Strengthening the rule of law and promoting human rights is key to this process, as is reducing the flow of illicit arms and strengthening the participation of developing countries in the institutions of global governance. The 12 targets within SDG 16 are wide-ranging and include those that relate to rule of law, corruption, accountability and transparency, access to justice and extended participation in democratic processes. In relation to conflict there is one target that specifically references the arms trade which reflects the work undertaken by civil society on the Arms Trade Treaty. By 2030, significantly reduce illicit financial and arms flows. These ten top spenders are responsible for 75% of global military spending, with the US alone accounting for 41%. It also must be noted that the Permanent Five nations on the Security Council (USA, Russia, China, UK and France) and Germany account for approximately 80% arms sales – all this while their role on the Security Council is to keep the peace. Were the world to reduce its expenditure on violence by approximately 50% it would repay the debt of the developing world ($4076 billion), provide enough money for the European stability mechanism ($900 billion) and fund the additional amount required to achieve the annual cost of the Millennium Development Goals ($60 billion). the ‘business’ of the defence industry does not advance or respect notions of ‘sensible defence’ spending when so much profit is to be gained from contracts and/or war. Its close relationship with governments around the world is central to this and we need the wider public to share the concerns of civil society groups working on how our taxes are spent with regard to military. We also need to challenge the notion that defence spending de-facto good for jobs and the economy. increased inequality around the world where the rich (individuals, businesses, nations) seek to consolidate their wealth while global poverty is widespread undermines local, national and international security and well-being. Over 900 million people in the world are hungry; 1.5 billion people subsist on less than US$1.25 per day. Furthermore, over 40% of people in the world live on less than US$2 per day. And this is not just confined to the global south – 40 million Americans are on food stamps in 2012. We believe that this international Five Percent Campaign, and its 5% Formula allows every nation – relative and proportionate to its economic growth and GDP – to share in ‘sensible’ defence budgeting with the long term effect also acting as a dampener on arms races. In the last ten years, the world economy grew by roughly 2.5% per year on average but global military expenditure increased on average by around 4% annually. Military spending is one of the least efficient ways of investing our limited resources to advance economic growth and prosperity; thus, the significant outpacing of its increase to the economic growth is harmful to the real economy and consequently the society. To paraphrase James Tobin, there is therefore the need to ‘throw some sand in the wheels’ of our excessively efficient international military-industrial complex. For this purpose, our proposed 5% threshold rule will serve as a break mechanism embedded in the budgeting process, deliberately intended to slow down the runaway military-expenditure increases around the world. In the meantime, the money thereby saved will be redirected to productive areas to further economic and societal advancement. The 5% threshold rule is our first step towards a prosperous economy based on sustainable sensible defense and the efficient use of our precious but finite resources. Tipping Point North South Ltd (TPNS) was formed in 2009 and is constituted as a co-operative ‘for the benefit of society’. Its two key areas of work are the support of feature length documentary film and social action campaigning. It can work across both the voluntary/NGO sector as well as the creative industries. Its activities include its film fund; partnership events that link film to issues; consultancy and in house commissions; single issue campaigning. The Five Percent Campaign has been developed by Tipping Point North South as a stand-alone proposal by Deborah Burton and Ho-Chih Lin. TPNS co-founder Kevin McCullough is Campaign Development Consultant. Tipping Point North South’s main activity (and which it trades as) is Tipping Point Film Fund (TPFF), supporting a small number of films in an executive producing role and working closely on their respective call to action outreach campaigns. Read Full Report: The Five Percent Campaign (pdf also available) and the Executive Summary (pdf also available).